Celebrity Big Brother Season 2 Cast Announced: Kandi Burruss, Dina Lohan, & More! According to an article from Hollywood Reporter, it’s quite the eclectic group. Real Housewives of Atlanta star Kandi Burruss will be a part of the cast. This is pretty surprising. 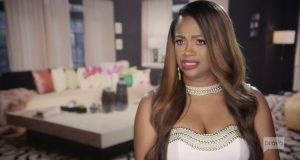 Sure, Kandi has been on other TV shows outside of RHOA, but those were all spin-off shows that revolved around her. It will be very interesting to see how she functions without her Kandi Koated Klique by her side. Joining Kandi is fellow reality TV veteran, Tamar Braxton. Former Total Divas cast member and ex WWE wrestler Natalie Eva Marie, also known as Eva Marie, will join the cast for Season 2 of Celebrity Big Brother. Lindsay Lohan is back in the spotlight thanks to her own reality show. Now two people connected to the former actress will be on Celebrity Big Brother. Will they have a Lindsay-centered alliance? Lindsay’s mom Dina Lohan and her Mean Girls costar Jonathan Bennett will reside in the Celebrity Big Brother house. Actors Joey Lawrence and Tom Green will also be on the season. Last season, Omarosa made major waves revealing details about her time in the White House. Now, former White House communications director Anthony Scaramucci is set to be a reality TV star. Will he follow in Omarosa’s scandalous footsteps? Let’s hope so! She spilled some piping hot tea last season! Spill away, Anthony. Olympic swimmer and one-time reality star Ryan Lochte will be in the Celebrity Big Brother house. Considering that he’s not exactly known for his sharp mind, he is bound to bring some GIF and meme-worthy quotes. Another athlete in the mix is former NFL running back Ricky Williams. As will Olympic hurdler and bobsledder Lolo Jones. Am I the only one who feels like Kato Kaelin has the longest “fifteen minutes of fame”? How is he still relevant? Yet here we are, over twenty years past the OJ Simpson trial and Kato Kaelin is one of the “celebrity” contestants on this show. Celebrity Big Brother begins with a two-night premiere starting on January 21. The “celebrities” will battle it out for a $250,000 grand prize and Instagram followers, of course. Celebrity Big Brother Season 2 will air for 13 episodes leading up to its finale on February 13. TELL US- WHAT DO YOU THINK ABOUT THE CELEBRITY BIG BROTHER CAST? WHO IS YOUR DREAM CELEBRITY BIG BROTHER CAST MEMBER?